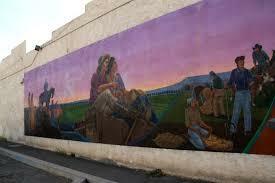 This mural in Delta pays tribute to the tradition of agriculture and diversity in the county. Students from Delta High School came to Paonia Town Hall on Thursday night to talk about civility in public discourse. The teenagers are part of a club called the League of United Latin American Citizens, or LULAC. The students came to Thursday's Community Forum and shared their experiences about conducting positive dialogue among groups with diverse viewpoints. KVNF News spoke with three of the students to get their perspectives.